Oops, it's been a week since my last post. I am going to be much more regular now--I've been super busy and frankly I've been having writer's block. I really want to keep this blog positive as it is going to be read by my children someday, and I've been under a bit of stress that I didn't want to document. On another note, this weekend we spent with Bill's side of the family. Bill's sister, Tiffany came in town. 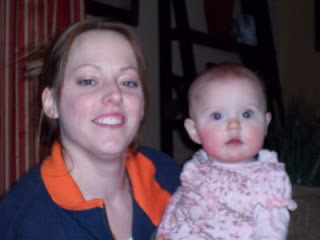 She lives in PA and had a baby girl, Ashley, last summer. This was the first time we got to see her. She is very cute, but the best part was watching Rori and Liam play with her. Both of them just loved her. They would make her giggle--it was super cute. 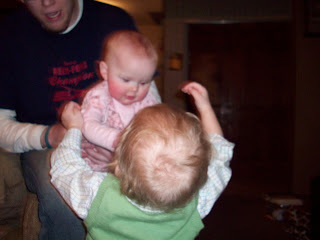 Rori acted like a big sister and kept bringing her toys and making sure that she was happy. Liam was incredibly gentle and kept patting her. 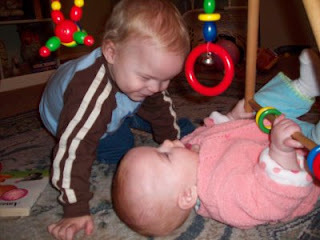 It was nothing like the way he plays with his big sister! I think he felt like a big boy taking care of his baby. I wish Tiffany lived closer because I know they would love to grow up together.